The Silver Age of Comic Books was known for goofy, lighthearted and rather fantastic plots, Black and White Morality, and a general absence of mature themes. Multicolored Kryptonite, dog sidekicks, Everything's Better with Monkeys and New Powers as the Plot Demands were all characteristic tropes. And then...well, The Sixties happened. And The Seventies. Comics were swept up in the same post-Vietnam post-Watergate disillusionment as the rest of the USA. The Comics Code gradually loosened, letting morally ambiguous stories appear more often. Character conflict as a plot device became the rule, and horror comics reappeared on the shelves. Some comics dispensed with the stamp of the Code altogether. Sources differ on when The Bronze Age of Comic Books started and the Silver Age ended. The most inclusive definition is that it started in 1970, when Jack Kirby left Marvel to work for DC, bringing with him the characterization-based style that had become Marvel's trademark created his ambitious, if short-lived, Fourth World titles. The same year saw the retirement of Mort Weisinger, Silver Age editor of the Superman titles. Amazing Spider-Man #96 and 97 were the first to abandon the Comics Code entirely; these issues ran a story with a strong anti-drug message, but the Code at the time didn't allow any references to drugs at all. Stan Lee decided to defy the censors and had the story published anyway. The issues sold well even with the controversy, and the gates were opened. Without the constraints of the Code, comics were free to address more mature issues. Creators were eager to prove to skeptical audiences that despite the Silver Age silliness that had become synonymous with the medium, comics could tell stories that were compelling to older readers. The Bronze Age is thus known for the first attempts to bring realism and adult issues to Superhero comic books, themes which would later overtake the genre entirely in The Dark Age of Comic Books. Overt sexuality appeared; necklines came down and hemlines came up. The Breast Plate started to appear on female characters such as Red Sonja, while males like Conan the Barbarian ran around with no shirt on. Religion also became available as a subject of discussion. The Legions of Hell started showing up, and religion-themed horror comics became popular. Perhaps most prominently, contemporary political issues appeared in comics for the first time since the Golden Age. Captain America went up against the Secret Empire, a conspiracy to take over the United States government whose leader was finally unmasked as a thinly veiled version of then-President Richard Nixon. This shook Cap so badly that he temporarily abandoned his hero identity, taking on the name "Nomad". Eventually, though, Cap realized he could champion the ideals of America without necessarily always supporting the government, and returned to the red-white-and-blue. Of course, the traditional Silver Age goofiness never entirely disappeared, leading to occasional moments of Mood Whiplash like Wolverine having a conversation with a leprechaun. Non-white Superheroes finally started to appear, although many were Captain Ethnic stereotypes lifted from the pop culture of the time—big, tough Scary Black Men with afros and Jive Turkey dialogue, Asian martial artists who spouted Confucian homilies (a notable subversion here being Iron Fist, who fits the bill in everything but one detail: he is not Asian), and so on. But some writers managed to transcend these cliches, bringing the first hints of true diversity to the genre. Prominent characters such as Storm of the X-Men, Cyborg of the Teen Titans, and Green Lantern John Stewart were all created with this honest effort in mind. Similarly, more superheroines began to show up on the scene, and established female superheroes became more confident, assertive and independent, taking a more active and prominent role in stories than they had in the Silver Age. The Invisible Girl realized she'd been holding herself back and renamed herself The Invisible Woman, became more aggressive and resourceful about using her powers, and took over as leader of the Fantastic Four; Hawkgirl similarly became Hawkwoman and finally joined the Justice League of America. Perhaps this new emphasis on diversity explains why the X-Men, who had been around but relatively unsuccessful in the Silver Age, rocketed to prominence under writer Chris Claremont and artists Dave Cockrum and John Byrne. The core group underwent a Revival as a Multinational Team, and the books used the theme of anti-mutant prejudice to drive plotlines, allowing it to serve as a convenient metaphor for contemporary issues like racism and homophobia. With contemporary relevance a major priority, existing characters experienced major changes as writers tried to "update" them for the times. Superman briefly lost his vulnerability to Kryptonite and quit his job at the Daily Planet to work as a TV newscaster. Wonder Woman was infamously stripped of her powers and made to learn karate. While many of these changes were later undone, some, such as Batman becoming more gothic in tone, remain in place to this day. The Bronze Age was also the era when the Fad Super became most prominent. This was the era of superheroes who fought crime using football, transport trucks, and disco, all stemming from creators struggling to come up with new ideas for superheroes with varying degrees of success. While some characters created this way, such as Marvel's Ghost Rider, would develop cult followings, most would simply be swept under the rug and forgotten. This was the time when many now-classic comic stories appeared—epic story arcs that covered multiple issues, a radical departure from the self-contained stories of the Silver and Golden Ages, which usually had the status quo comfortably restored at the end of each issue. The Dark Phoenix Saga deserves special mention as an epic storyline that not only put a female character in the Tragic Hero role, but ended with a major, well-established superhero Killed Off for Real—and, just as unprecedented, her death was not immediately forgotten, but continued to affect the characters who had known her. The Bronze Age also saw Spider-Man's girlfriend Gwen Stacy killed, an unprecedented move that sent shockwaves throughout the industry. It was the first time a superhero had failed in the attempt to save the life of his own Love Interest, and as with the Phoenix Saga, characters who had known Gwen grieved over the course of multiple issues rather than immediately moving on. Perhaps more than any other single event, Gwen's death was a big red sign that the innocence of the Silver Age was over. On the DC side, it was during this time that Green Lantern and Green Arrow teamed up for a groundbreaking socially conscious series where they tackled real-world problems facing society, such as racism, poverty, corruption, and drug abuse. Batman began to return to his roots as a brooding, tortured vigilante, and his enemies (especially The Joker) were allowed to kill again. They took full advantage of the privilege, as did other villains, who proved they would even kill main characters when the Reverse Flash murdered Iris West, wife of The Flash, six years after the death of Gwen Stacy. Not only the content but the format of comics was being experimented with. Comics creators were ready to take chances for the first time since the creation of the Comics Code in the late 1950s. The first "graphic novels" showed up, complete book-sized stories in a single volume. Black-and-white, non-Code-approved magazines appeared on the newsstands. Satirical comics, political comics, comics that pushed the envelope of art, many different gimmicks were thrown at the wall to see what would stick. At DC, this meant a boom of new titles, and larger comics with more pages dedicated to story, in what was called the "DC Explosion". Over 50 new titles were created. 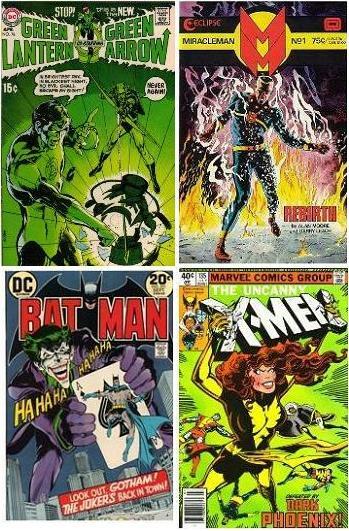 Unfortunately, most of these were later canceled in the infamous "DC Implosion" of 1978. With that debacle, the new management of DC picked up the pieces with more sensible moves like the Limited Series publishing concept, which allowed comics that could tell stories in deliberately short runs that don't have to trap the talent into unsustainable indefinite runs. In addition, the magazine Heavy Metal introduced North American readers to translated continental European fantasy comics, which had am alluring content freedom and narrative daring undreamed for native talents. Some people consider this the time period when comics started getting more insular, creating today's view of the geekish, obsessed comic book fan. Certainly, the average age of readers increased, as the "adult" aspects grew more and more prominent in the books of the day. Eventually, this trend would take over the genre so completely it culminated in a new era, Dark Age. The Bronze Age's end is debated, including whether it has ended at all. One suggested turning point is 1986, when DC's Crisis on Infinite Earths concluded and ushered in a wholesale revision of the DC Universe, making the company a legitimate challenger to Marvel once more. In addition, the company published the seminal and highly influential miniseries Watchmen and Batman: The Dark Knight Returns, which introduced a new and darker take on the superhero genre. However, some works with Dark Age sensibilities such as Alan Moore's V for Vendetta (1982), and Frank Miller's Ronin (1983) had debuted a few years previously. Even Marvel's The Punisher, one of the key figures of the The Dark Age of Comic Books, debuted as early as 1974! The Bronze Age is underrepresented in the area of trade paperback and hardcover reprint collections. The Age ended just about the time such collections started happening at all, and they tended to be of recent material—i.e., Dark Age material. When publishers started seriously collecting their earlier work in archival collections, they began at "the beginning", in the Gold and Silver Ages. Said collection series tended to peter out in sales before reaching the Bronze Age. (Notable exceptions are the X-Men and the Teen Titans, the two hottest books of the era.) Ergo, there are entire contiguous decades of mainstream comics which remain unavailable except in back-issue bins. Jack Kirby's Fourth World cycle consisting of Mister Miracle, The New Gods, Forever People, and Jimmy Olsen. (Kirby had just defected from Marvel. Indeed, a thinly-veiled attack on Stan Lee appears in one of these books.) This introduced characters such popular characters as the Big Bad Darkseid. He intended the story to work, after release, in what we would now call a graphic novel-style trade paperback format. Unfortunately, Kirby was ahead of his time and DC editor in chief, Carmine Infantino, pulled the plug when sales apparently didn't match the hype, although the characters soon became mainstays of The DCU. The satirical Howard the Duck by Steve Gerber briefly outsold everything else in the DC/Marvel axis during a few years in the mid-to-late '70's. X-Men, which eventually became so popular it nearly took over the Marvel Universe. The Bronze Age X-Men was defined by Chris Claremont's long run as writer, which brought such classic storylines as the Phoenix Saga. The New Teen Titans became DC's answer to X-Men, and was so successful a rework of a formerly failed property that it inspired the company to have the book's creative team do the same for the whole DC Universe during and after Crisis on Infinite Earths. The Superman story "Whatever Happened to the Man of Tomorrow??" by Alan Moore, released simultaneously in Superman and Action Comics in 1986, during the one-month gap between the end of Crisis on Infinite Earths and the beginning of the Man of Steel reboot. It serves as a finale to the storyline of Pre Crisis Superman, taking every element of Silver Age and Bronze Age Superman that was removed Post-Crisis, and follows it to a dark, sad, (semi-)logical conclusion. This could easily be considered the last Bronze Age story, and a eulogy for the Silver Age as embodied in Superman. Britain's 2000 AD, a weekly Sci Fi anthology debuted in 1977. It would go on to launch the careers of many influential British comic writers and artists during the early 80s, including comics legend Alan Moore. Its most popular strip, Judge Dredd, marks one of the earliest attempts at bringing moral ambiguity to the medium, and explored Cyberpunk a full 7 years before Neuromancer was written. It also more or less created the British comic industry, and is to this day the most successful British comic series of all time. Swamp Thing, both the original version (debuting in DC's horror series The House of Secrets in 1971), and the earliest part of Moore's celebrated run (beginning in 1984) came out during this period. As did The Movie in 1983. Under Moore it became deeply political, dealing with themes such as race, feminism, environmentalism, and animal rights. Camelot 3000, one of the first major direct market projects, and DC's first maxi-series. Also notable for its Genre Busting, political commentary, and for pushing the envelope in terms of adult content and themes. Miracleman, One of the first Major Deconstructions of the superhero genre, as well as one of Alan Moore's pioneering works. Without Miracleman, there might not have been a Watchmen. Secret Wars. Marvel got wind of DC's planned Crisis on Infinite Earths, and decided to release its own big crossover event to beat them to the punch. While it would never have the same far-reaching impact as Crisis, it was still the first Crisis Crossover, and thus worthy of mention. Marvel's Conan the Barbarian, as well as spin-off title The Savage Sword of Conan the Barbarian (usually just called "Savage Sword" for short), both the biggest sword and sorcery Comic Books. Squadron Supreme, a Marvel maxiseries by Mark Gruenwald, explored the ideas of superheroes taking over the world to create a utopia in a realistic manner, i.e. everything goes wrong by the end of the series. Possibly the first serious exploration of "superheroes in the real world" in American comics, predating such works as Watchmen and Kingdom Come. Jonah Hex, the last great Comic Book Western character, was created during this period. The World of Krypton, the first major limited series title, which gave the mainstream comics market a new publishing flexibility. Usually accepted as lasting from Jack Kirby's move to DC, to the publication of Watchmen and The Dark Knight Returns 1970-1986. Alternatively starting when comics began costing 15 cents (1969) or Spiderman #100 (1971). ↑ but not the first sword and sorcery comic; that honour goes to little-known horror title Chamber of Darkness - specifically, the fourth issue, which starred Conan Expy Starr the Slayer, and came out a whole six months before Conan the Barbarian #1. And now you know! This page was last edited on 19 September 2017, at 16:26.